One of the things I like best is High Speed Photography, it is an art that combines a hard technical challenge, along with an opportunity to have an artistic say. We’ve featured a few DIY articles about DIYing it, but nothing beats dedicated controllers. 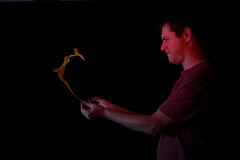 This is why I was really happy to play a bit with the Universal Photo Timer – a heaven for High Speed Photographers. I’ll write a review about it soon. (I know – the name says timer, but it is actually way more then just a timer) Till then, I’d like to share a High Speed shot I did, and with it the process of polishing a picture (or some aspects of it) till it is good. I will also discuss about what’s missing from the final image. So we wanted to take an image of a popping balloon. By we, I mean Yossi AKA portrait cheat sheet guy and me. While the technical challenge was clear, we were not sure about the artistic say that we wanted to convey. Mad scientist, angry madman and discovering something were all themes we thought about but did not come to a conclusion. We decided to overcome the technical challenge and move to artistic say later on. Now what usually happens when you put technicality before art, is that art will suffer. That was the case on this shot, and I’ll talk about this in a bit. 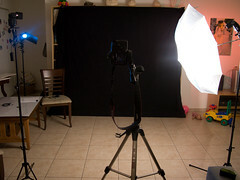 The first challenge was setting up the initial lights and setting up the voice trigger. We wanted to use several strobes, so we needed a way to trigger them all. We connected a cactus trigger AKA Gadget Infinity AKA Poverty Wizard to the Universal timer and we were good to go. To get some effect we also gridded and gelled the main flash with a red gel. The next thing we did is kill the lights. We used little flashlights to find our way before and after each shoot. We also moved to manual focus and made a mark on the floor to note the location where the camera is focusing. We did this because we did not want to and could not use auto focus in the complete darkness we were in. It is this complete darkness that allowed us to set the shutter speed on bulb. We did the first test without popping any balloons, just to see that the lighting is right. This is something that we did with each change of setup. You can see the image on the left. This is something that we did any time we wanted to change or adjust the lighting, let me tell you, we saved a bunch of balloons this way. So the workflow went something like this: 1. Set up lighting. 2. Make a test shot. 3. Adjust and go to one. 4. Take a real shot with a popping balloon and all. Once the lighting was good we took several shots, just to get my expression right (oh, yea, that me in all the pictures). 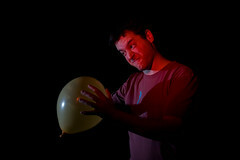 In the first few tests, we got the flash pop at the right time, right as the balloon popped. But the balloon shrank so fast, we could not capture the shape of it once it exploded. 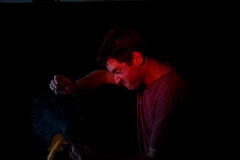 The final image just looked like me with a piece of rubber in my hands. This made a boring image with me and 90% dead balloon. No fun. We needed to come up with a way to make the balloon pop a bit more interesting. We saw that the rubber shrank too fast and needed a way to show what was there, just a millisecond after the balloon popped, but a milli before all shape was lost. I suggested splashing some baby power on the balloon, but Yossi kindly suggested that I would sleep on the living room sofa for a whole week if we filled the living room with baby power. This was definitely better. The balloon had a nice shape to it and it was clear that there was something there just before the balloon pooped. However, the balloon was really not the center of the image. It was hardly seen at all, if you really want to be picky. This is something that we can fix with lighting. To fix this we used an extra flash positioned behind the place where the balloon will pop. Sending back light to a semi transparent object will create the effect of light going out from this object. We used a computer cooling gridspot to avoid flare from the flash and to make sure that light will only hit the balloon. The result is, again, on the left. 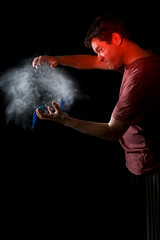 As we were lighting me with a flash gelled red, it was only natural to light the popping water with a blue gel. For two reasons. 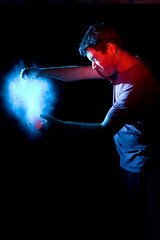 Blue is a great contrast to red and blue is a cool color for “cold fusion”. So we used this gel to take the final shot. Sure, we nailed it with the technical stuff, am I happy? Partially.It is technically OK, but no art. I am happy with the way we controlled the setup, made the trigger work and overcome the technical difficulties of popping and lighting the balloon. I will surely use this technique again if I want to create a similar effect. One thing that I am sorry about is not giving enough attention to the artistic say. Next time I will take this image, I will setup a better background and wear better clothing. Maybe a Jeans and a nice buttoned t-shirt – that would pass as a scientist for sure.